Administrators at Northeast High School suspended David Duren-Sanner, 18, after officials found a knife inside the car he had driven to school last Thursday — a vehicle that belongs to his father, a commercial fisherman. The fishing knife was discovered during a random search. OK, if you are one of those who will read this story and think there is nothing wrong with it, then congratulations: you are one of the insane! But don’t worry; I used to be among your number, so there is still hope. If I can wake up from this stupor of indoctrination, I’m sure you can. You just need someone to help you see what you have been conditioned to overlook. It all starts by understanding what ‘public property’ really means. So, we live in a free and self-governing society, right? OK, we used to live in a free and self-governing society. Just pretend we still do. Now think hard: what does that mean in relation to ‘public property?’ I’ll tell you. It means every citizen has as much claim to that property as any other. In other words, public property belongs equally to all of us. OK, so far, this sounds simple, right? So why do you treat public property any differently than your own? Do you think the government owns your home? Does it have the right or authority to tell you what you can do with your home? How about telling you what to do with your car? Or your computer? Your cell phone? Your I-Pod? Your clothes? Your body? I hope you said no, government has no authority over any of these things unless you are using them to harm others or damage their personal property. So why do you accept the government’s claim to ‘own’ your property rights to public property? Now let me ask you another question. Do your individual Natural Rights exist only if you stay in your home, or do they go with you wherever your body goes? Again, I hope you said your rights go with you wherever you go – because they do. So again, why do you accept the government’s assertion that your rights are somehow diminished simply because you are on public property? They are not diminished. Natural Rights cannot be given or taken away, they can only be voluntarily restrained as a result of the Social Contract we call society and the rule of law. If you have a right to something while you are in your home, you have just as much right to it when you are on public property. The only thing that changes is your duty to exercise that right with more restraint so as not to trample the rights of others who are on that public property with you at the same time. However, in the story above, the government is saying that once you step foot on public property, you no longer have your rights. My friend, that is called tyranny and it is un-American. It is so un-American that, were they alive today, our founding fathers would be shooting over this story. If you doubt me, let’s look at this story again, only with our new understanding of public property and rights. First, this student has a Natural Right to self-defense, therefore, the government has no – zero – authority to tell him or anyone he cannot keep and bear arms. 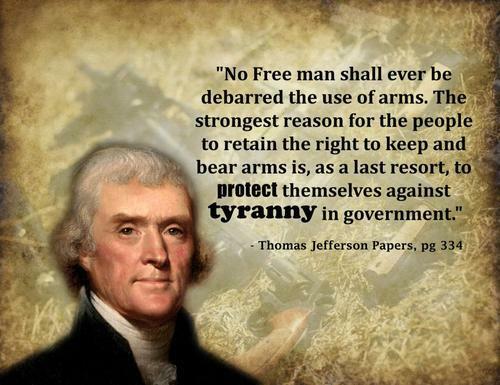 A knife falls under the definition of arms, therefore, the government trampled his second amendment rights. Second, we have the right to be secure in our person and effects whether we are on private or public property. The government cannot claim the right of search without warrant just because we are on public property – especially after passing a law forcing children to be there to attend school. So the government has trampled this young man’s fourth amendment rights. Next, the young man had a sentenced passed on him without due process. He was assumed guilty and treated as such without a trial. The Constitution prohibits any punitive action – confiscation of our rights – without a trial by jury, yet this is what has happened here. So the government trampled the young man’s right to due process, which also includes the right to face an accuser, interview witnesses, conduct his own investigation, present evidence and witnesses on his behalf and even – if he wanted to – to testify on his own behalf. Nor do I think he was provided with legal counsel. Why the bloody hell are you accepting the government’s claims to your property, your rights and your life simply because you are the public property you hired it to manage – not seize? And you Leftists out there really think we should or even can trust the government to protect us? There’s hope for most of us, but you Leftists are a special kind of crazy for which there is no cure.